​Hi! I'm Bree from My Crafty Crap over on Instagram and I'm excited to be sharing my thoughts today about On the Go Bags from C&T Publishing. It was put together by the amazing Lindsay Conner (of Lindsay Sews) and Janelle MacKay (of Emmaline Bags) and includes projects from so many of my favorite designers. ​I really like that the book includes a variety of projects that are divided by experience level. I have actually had the book for a while now, and the cover bag is the main reason I picked it up in the first place, but I know I will make some of the other projects in the book as well. I generally can't justify buying craft books when I already have so many other patterns, but this is one I couldn't pass up. There are projects in all three levels (Easy, Intermediate, and Advanced) that I hope to make. I recommend doing a quick search for sew-alongs for book projects if you are intimidated by them. Often times there will be additional tips and tricks that will help you with the more difficult parts. I have found that due to limited space in books, instructions are sometimes not as thorough or have as many pictures as I am used to with stand-alone patterns. That's not saying craft books are not as good, just something to keep in mind and get use to. Janelle and Lindsay both have multi-part sew along posts on their blogs for projects in this book (the Airport Sling and Sporty Strap Pack), and I've seen others too. Make sure you check them out! I was provided with an eBook version of my choice of books for this series, but decided to go with one I had already purchased in book form. Personally I like to have physical copies of books/patterns rather than working from my phone or a tablet. I find it much easier to flip through a book than a digital pattern, but I do love having the pdf versions of the pattern pieces. Sometimes the physical books can be a pain to use though because they don't lay nicely, and it's annoying trying to keep your place in the book when you're trying to figure out what you should be doing next. To solve this problem, I took my book to a local print shop and had it spiral bound. What a game changer! It was relatively cheap (under $4.00) and worth every penny. The physical book includes one large pull-out pattern piece that is printed on both sides. On the one hand, that can be annoying because it means you have to copy the pattern pieces in some way (through a print shop, tracing, etc), but that way you always have another copy in case something happens to the pattern piece you're using (I saw a woman recently who was looking for replacement pattern pieces from a book because her pattern pieces had been "toddlerized." I had to laugh because I knew exactly what she meant, but that's the problem with only getting one copy of pattern pieces in a book). The really nice thing about the pullout pattern pieces is that they are all one piece - no taping & matching lines! The eBook version comes with pdf pattern pieces that must be taped together before cutting. While not difficult, it does take extra time that I would generally much rather spend sewing. There are also a lot of rotary cut pieces for all the projects. The book starts out with an introduction by Lindsay and Janelle, followed by general techniques that apply to all/most of the patterns in the book and are just really good general project tips to apply to whatever you might be making. There are also super handy tips & hints scattered throughout all the patterns in the book. They are definitely helpful! If you happen to know anything about me, you know two things - I love pockets and for the life of me I can't follow a pattern as written. It's not necessarily that I can't follow directions, I just always need to change something up, and pretty much always have to add pockets. For my bag, I chose to add the zip around pocket from the Airport Sling pattern in the "advanced" section. This pocket is definitely the reason the Airport Sling is an advanced pattern, but it's just such an awesome pocket! It zips around the outside and has a pocket with card slots. It's like the Cadillac of pockets. ​The other change I made was to add a pocket to the strap. This wasn't something I planned on doing, it was pretty spur of the moment because I happened to have a perfect zipper for it and was feeling reckless, but it might be my favorite part now! It ended up being not quite as functional as I had hoped after turning out the strap & top stitching (I did skip the second row of top stitching on the lower part of the strap to save as much space as possible), but it's still perfect for chapstick, keys, or some change. Strap pocket before putting the strap fully together. My only real complaint while working on this bag is that zippers are listed in the materials for what size to buy, but I wish it also gave the total zip length after the tabs are added in the pattern. This may seem picky, but I don't buy zippers specifically for certain projects, but just keep them on hand in a couple standard lengths & cut to size for what I need. One part of the pattern called for a 14" zipper, and to attach the zipper ends outside the stops. Generally, when you buy a zipper, the length is the distance between the stops, but when you're figuring in the size of the stops (which can be slightly different with different brands and styles of zips) that adds a bit of length too. I know in the grand scheme of things it may not seem to matter, but that 1/4"-1/2" difference can actually make a big difference when it comes to fitting a zipper around a curved piece. For example, I was putting in the zipper for the front pocket & did my best to guess at what my exact zipper length should be. The first time I tried piecing in the zipper, I ended up with quite a bit extra at the bottom. I wasn't sure if I had guessed wrong on getting my zipper length just right, or if I didn't get it placed around the curve correctly. If the total zipper length had been provided, I would have known right away that I just needed to rework the curve around the zipper to get it to fit instead of trying to figure out which of two things was my issue. In the end I was able to reposition the zipper in the opening & get it to work, but my zipper still ended up wavier than I would have liked and I'm not sure if it's because I just didn't get it in there smooth or if it's actually the incorrect length. I'm sure I'm the only one who will notice, but it's still a bit of a frustration. In the end, I really love how my bag turned out. I already used it at the park earlier this week and it was perfect for a few essentials and super comfy when chasing the kids around. I did end up swapping out the elastic pocket for a zippered pocket in the lining too. Overall, I definitely recommend On the Go Bags. I really enjoyed reading through it, working on this bag, and look forward to working on more projects from it. I think first up will be the Hipster Pocket Scarf! Thanks for having me, Reece! Thanks so much Bree! I always love your fabric combos and this one is no exception! I really love your modifications too! If you're just joining us now, make sure to go through the rest of the week's reviews (Monday, Tuesday, Wednesday, and Thursday) to get caught up. 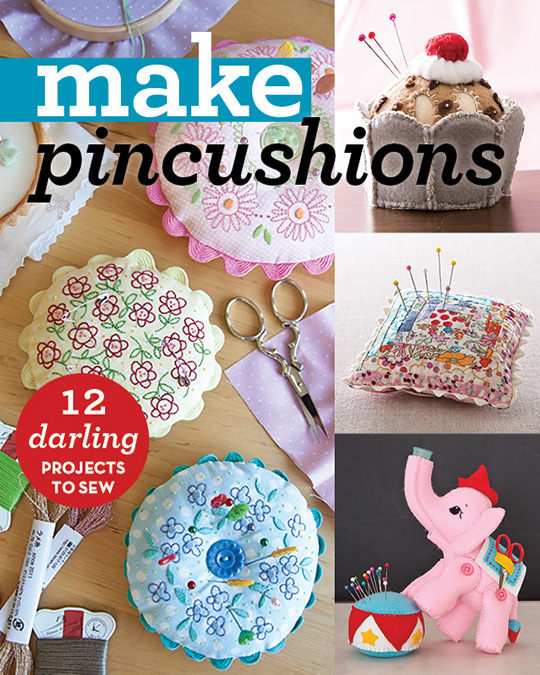 Andrea from Stitcharmony joins me today to review Make Pincushions 12 Darling Projects to Sew. For my very first review I chose Make Pincushions 12 darling projects to sew. Why did I choose this book? Well, I've been on Instagram now for just over 6 months and I am loving all the creativity, inspiration and support. If you sew like myself, part of the fun on Instagram is joining creative sewing swaps that are usually hosted by someone you may follow. The short of it is... you create something for someone and in the meantime someone is busy working creating something for you. It could be anything from a mini quilt, to a bag, etc... You get it right? If you are in a swap you may also want to create "extras" for your partner to add to your package. Being a sewing swap who wouldn't need or want a pincushion? So I thought this would be the perfect book for me as I am always looking for fun quick gifts to add. First off, I love ebooks. Don't get me wrong, I do love books too, but ebooks are instant gratification as you just download and off you go! No waiting for the truck from Amazon or stalking the delivery person. The layout of this book is great. It's simple and very straight forward. I'm a visual learner so I love the small diagrams and photos that go along with each project. I find the book starts with the fairly easier projects then continues on to harder ones. The only thing with this ebook is you do need a online printer to print out some of the patterns in the book. So if you don't have access to one you will not be able to create more than half of the projects in the book. The two pincushions I chose were the Kaleidoscope pincushion by Jeni Baker AGF designer and the Boxy pincushion by Virginia Linsday of Gingercakes. Both of these projects took less then two hours total to complete, and they probably would have taken less time without interruptions (rare in my world)! The Kaleidoscope pincushion calls for 18 different coloured 2" squares. I did not have time to run downstairs to my solid stash and start mulling over colours so I went a different route. I chose my mochi linen dot bundle (magic number 18!) from the Fat Quarter Shop and just like that, an hour later I had my lovely rainbow mochi linen dot Kaleidoscope pincushion! I really enjoyed this pattern, it is so simple and so versatile that you really can make it your own. Maybe a small fun print or some Liberty floral? My next pincushion I chose to make was the Boxy Pincushion. This one I decided would possibly be created for the reason I chose the book in the first place...my current swap which has a beloved Heather Ross fabric theme. I decided on her coveted briar rose strawberries and gnome fabric. This was also a super quick make with lovely results. Also very versatile as you can fussy cut the covered button or add a wooden button instead. The possibilities are endless! This book has some great simple projects for beginners to more experienced ones for the experts. It has a plethora of very talented authors with so many different projects that there really is something for everyone - from fabric, to felt, to embroidery. There are some very unique ones too where at first I thought, "who would make that?" But if you're like me on Instagram joining all these fun swaps, who knows, you may just join that insect themed swap and just have to make that super cool ant pincushion!!! Some lucky swap partners Andrea has! Those adorable handmade pins are perfect for the pincushions too. If you'd like a copy of this book, you can find it here. Click through the last 3 days (here, here, and here) to see the other sewing books that have been reviewed this week, and check back in tomorrow for the final book this week. Hi! I'm Natalie of HungryHippie Sews. 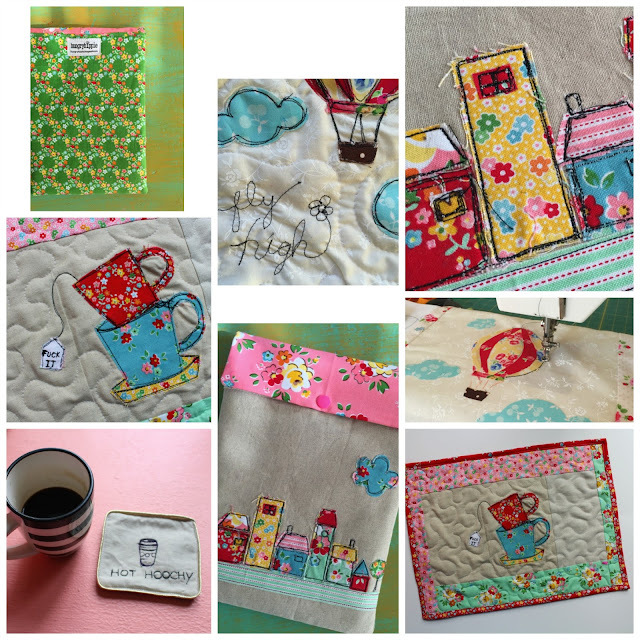 I had the privilege of reviewing Sew Illustrated by Minki Kim and Kristen Esser, made available by C&T Publishing. This book teaches several techniques for making illustrations or pictures with your sewing machine. The projects inside are numerous, and very in skill level. They are ALL super duper cute! I printed out the PDF file so I can look at it anytime. It is major eye candy! I decided to make a pillow, a mug coaster, an iPad holder, and a place mat. Since I had the PDF version of the book I did not have the iron-on illustrations that the "real" book provides. That's ok-but I think I will be purchasing this book so I can speed up the process. For now, I was able to draw the illustrations free hand, then proceed as the book instructs. For the coaster I used a stamp, which was simple and quick. Here are some photos of my steps for the pillow. I used the Air balloon scene and then added borders and mini pom pom trim. For this project I used my free motion foot and "drew" with the thread. This method is much less precise if you are after straight lines or perfection. Personally, I like the wibble wobble and find it adds an element of charm. Just needs a pillow insert and she's ready to go. For the coaster project I used a rubber stamp on linen. I then sewed directly on these lines with black thread. This method is fun and quick. Use grippy gloves when drawing with thread, it helps a ton! For the letters I drew them out and stitched over the markings. I used a Frixon pen so the ink irons out. This was very fast, and I could see a set of four as a great stocking stuffer! The place mat project took a bit more time. I drew it out, then cut my freezer paper and fabric together, fused it to the linen, and then sewed it all down. It's interesting how it looks sort of weird until that last step is complete--the black thread really brings out the picture and defines much needed details. Of course I had to add some sassy 'tude. 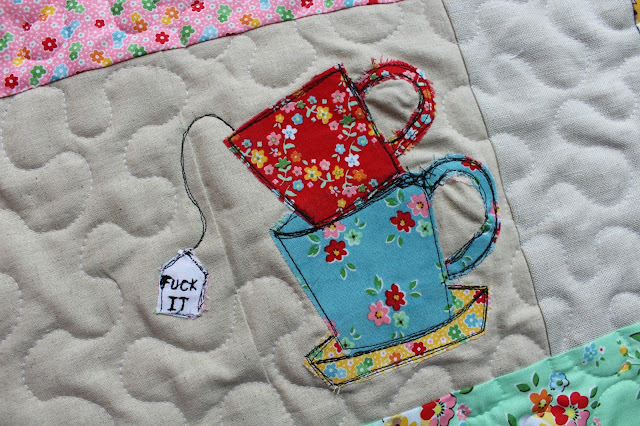 Nothing a cuppa tea can't solve. 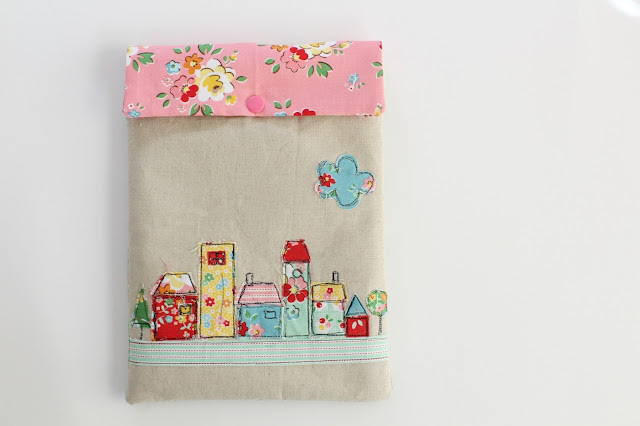 For the mini iPad sleeve I used the same fabric as the tea cups (Nadra Ridgeway for Riley Blake) and made the little town scene. I fused wonder under to the fabric wrong side, and then cut my shapes out accordingly. After fusing them down, I drew with a regular sewing machine foot first, then went back over with a free motion foot. Several passes gave the thickness of line I was looking for. I drew it out roughly on the linen first, to make sure it would fit. I super enjoyed this book, and will be buying the old school paperback version. The instructions are really well written, and the projects are too cute to pass on. Thank you Reece for having me over! Umm wow! Each and every project is incredible! Thanks so much Natalie for sharing! Check out more of Natalie's work and follow her blog at Hungry Hippie Sews. 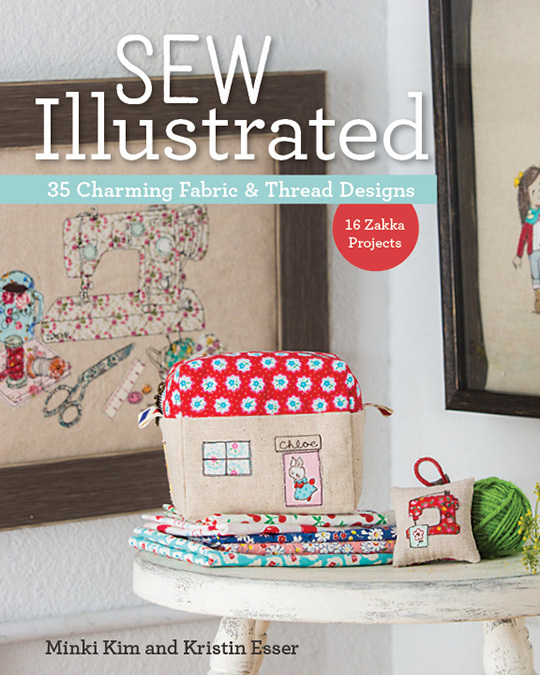 To get yourself a copy of Sew Illustrated, head on over to C&T Publishing and pick one up. Check in again tomorrow for another book review, and head back to Monday and Tuesday's posts if you missed them. I'd love to hear if you've read any of these. Hi! I'm Crystal of the Cloth Albatross. I was so excited when Reece asked me to review a book for C&T Publishing. The biggest problem I had was choosing which book I wanted to get. C&T has several bag making books by awesome designers. A couple of their bag making books I had already purchased (On the Go Bags, and Zakka Style), so I went with one of the newer releases - Perfect Patchwork Bags by Sue Kim. I was unfamiliar with Sue Kim, so I was excited to find out that she's the designer behind ithinksew patterns. She has several bag patterns that I've always wanted to try but for some reason haven't purchased yet (maybe because I have way too many patterns and not enough time to make them all). After making a pattern from her book, I definitely need to add some of her bag patterns to my collection. The Demelza Backpack might be first on my list. Perfect Patchwork Bags includes 15 projects and I was unsure which one I was going to make. I narrowed it down to the Mackenzie Messenger Bag, the Chloe Bag, or the Scarlett Clutches. The Mackenzie Messenger Bag is my favorite style of the 3, but I ended up going with the rectangular Scarlett Clutch. I chose the clutch pattern because love triangle piecing and didn't have the proper hardware for the Mackenzie Messenger Bag. Really, it had nothing to do with me being lazy and choosing the easier project. The Scarlett Clutch has 2 versions - a rectangular shaped clutch and a square clutch. I went with the classic rectangular shape but the square clutch is funky and different. One thing that I really like about the Perfect Patchwork Bags is that each project has several different bags made from the pattern, including one that's not patchwork. Sometimes it's hard to envision what a bag looks like without the added interest of patchwork, so it's a big plus that she included pictures and the changes that need to be made to the pattern. This particular comparison (bottom right pic) is not the best because the fabric is Echino (a Japanese fabric that already looks like it has been pieced) but you can still tell that the clutch looks great without the piecing. One of the great things about piecework on a project is that you can use fabrics that you love but don't have enough of for a full project. It's something that you can use up your scrap pile with or highlight smaller aspects in fabrics that don't stand out as much when they're part of the larger piece of fabric. For my clutch, I chose fabrics by Rashida Coleman-Hale of Cotton + Steel. I love her style and thought that these prints from two different collections (Mooonlit and Macrame) were fun together. I made a couple of changes to the pattern. I only pieced the flap, rather than the whole body; and I didn't use the accent piece on the bottom of the front flap. In hindsight, I prefer the way the clutch looks with the bottom trim on the flap but when I was putting it together, I did the bottom in vinyl, so I didn't want to have the accent trim in the same material as my clutch body. Next time I would choose a complementary accent trim. This clutch would look good with a pink accent trim. I do like having the body in vinyl because it breaks up the piecing and doesn't make the clutch so busy but next time I'll definitely leave the accent trim on. The lining I chose for the clutch is also from Rashida Coleman-Hale's Macrame collection. The Scarlett Clutch's flap closes with a magnetic snap and its main body closes with a zipper. For pattern books, I prefer e-books over hardcopies of books because your pattern pieces are already digitized, so you don't have to worry about scanning them in. In some pattern books, the pattern pieces are overlapped for different patterns but in this book, they're all separate, which I really appreciate. I did have one issue with a line being incomplete on a pattern piece but it was within the seam allowance and was easy to see where the line was supposed to go. However, I emailed C&T about the issue and they responded within an hour saying that they would fix the digital download (and they didn't even know I was writing a book review!). I was really impressed with the fast response. I didn't expect to hear anything back until the next day at least. Another reason that I chose this pattern book is because I was unfamiliar with the designer. I wanted to be able to look at the patterns with fresh eyes. It's really easy to get used to a designer's pattern writing style and skip over confusing bits by remembering how they've done things in previous patterns. I was very impressed by Sue Kim's pattern writing style. I found the patterns easy-to-follow without being drawn out. Another great thing about this book is that you can use the piecing templates for piecing on bag patterns that you've made before but want to give a different look to. 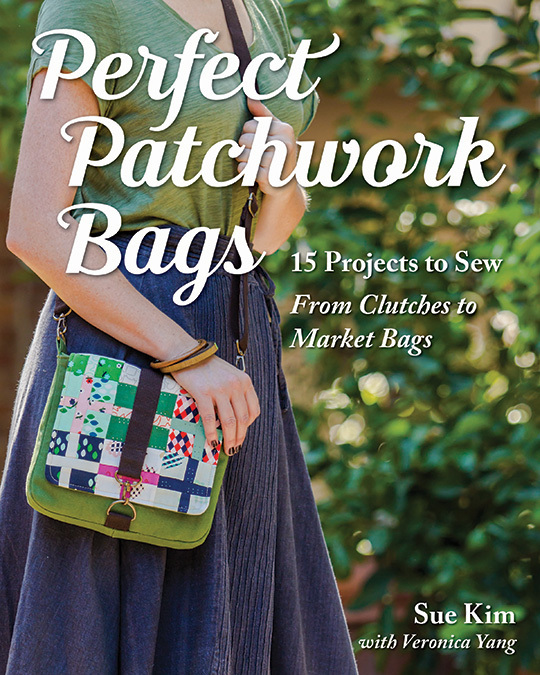 Conversely, I think all of the patterns in this book look great without piecing, so even if you're not into the patchwork look, you might still enjoy Perfect Patchwork Bags. Thank you so much Crystal! I always enjoy seeing your work! Remember to check back tomorrow for another sewing book review. If you missed yesterday's, you can catch up here. Disclosure: This post contains affiliate links. I received this eBook in exchange for an honest review. Some links in this post are my affiliate links, which means I may earn a small commission on purchases made through these links at no additional cost to you. All opinions expressed here are my own. For my review, I chose Sew Organized for the Busy Girl, by Heidi Staples. I work full time outside of the home, I have little kids (and I'm also now officially a soccer mom), I sew, and I blog, among other things, so "busy" is a way of life for me. Anytime I can find ways to cut down on chaos and fit more into my day, I'm all over it, so when I saw this book, I just knew it was for me. The book has tips to get and stay organized, and plenty of projects to sew for when you've managed to fit in some sewing time. My review copy is an eBook, but this book is available in the traditional book format as well. I like the clutter-free aspect of eBooks: I flip through pages of eBooks in my sewing room, and have access to all of them without taking up any more space than my tablet. I also keep my sewing patterns on my tablet. This book doesn't have any patterns to print so I don't need a hard copy of anything. The layout of the book makes so much sense to me: it starts with finding out why we sew and what our different motivations may be, then moves on to how to create an organized space, and then how to carve out time for sewing. Once we learn about that, we move to the projects of the book. There are even some basic sewing tips at the end, since the projects offer a wide variety, it's quite likely that you could learn a thing or two from the variety of techniques used throughout. 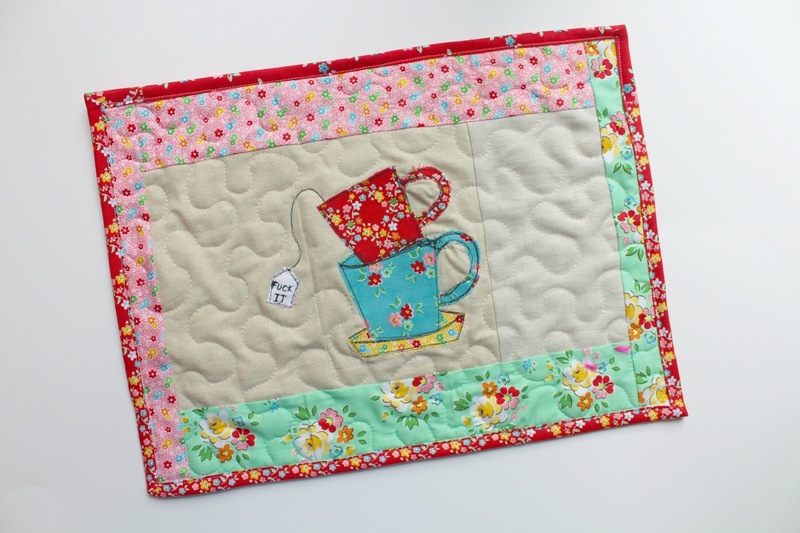 Heidi Staples is a sewing blogger and can be found on her blog Fabric Mutt. I like that she talks about her real life in the book, and it helped me relate to what she was saying. We're both busy moms just trying to squeeze in a little extra time for creating. Along with tips and projects from Heidi, there are questions answered by other "sew-lebrities" throughout the book, which I found fun and inspiring. There are tutorials for 23 projects in the book, and the variety of projects is great. There are pillows, bags, quilts and other home decor and useful projects. Most of the projects are fairly simple and come together quickly, and I enjoyed that there are many techniques used for them all. Some of the projects are more involved and I'd love to try one of the quilts (one day). As my first project from the book, I chose the Double-Zip Clutch. It's a really versatile finished project and only took a couple hours. There are so many things you can do with this design: the book suggests using it as a stationery keeper, a diaper clutch, a beauty kit, and several other bright ideas. It's really adaptable too! I used mesh for the inner pockets instead of fabric, and used one of Emmaline Bags' Half Moon Magnetic Edge Clasps on the flap. This may be my new go to for quick teacher gifts! Overall, this is an enjoyable book to flip through, and pick up tips throughout. I found the tips to get organized weren't revolutionary but they did serve as good reminders to me for habits that I should be forming. I have noticed that I've been more productive with my sewing since reading this book. One thing I particularly enjoyed from the tips was a focus on blogging as well. I didn't realize the book would talk about blogging so it was a pleasant surprise. One theme I picked up on all through the book was that it's ok if we're not superwomen, and sometimes that permission to not do it all is so relieving. The projects are for the most part fairly simple and quick. They would all make great gifts. I think the variety of projects is what makes this book a double winner. I love that there are hand-sewing projects, half-square triangles, zippers, and quilting for people to try out. I often hear someone saying they're good at one type of sewing, but not at another, and I think this book offers those opportunities to branch out of our comfort zones. Choose from book or eBook and pick up your copy today, just click here! I hope you enjoyed this review. Check back tomorrow for another sewing book to be reviewed. p.s. I used the Lavish fabric collection by Katarina Roccella from Sitka Fabrics. I've always had a passion for books. Once I started sewing, it was only natural that I love sewing books. C&T Publishing offers a host of sewing, quilting, and craft books. They also carry some fun and wonderful gifts, like temporary tattoos and and "quilty" pencils. Many of the books from C&T are offered in both book and eBook formats. I've called on some sewing friends to each review one book and share their review here with you. You'll find reviews from Crystal of The Cloth Albatross, Bree of My Crafty Crap, Natalie of Hungry Hippie, Andrea of Stitcharmony, and myself. We have some great variety in store for you and I hope you'll find a new favourite! Starting Monday September 12, check in each day to find out about a different book.